Oracle Database 11g Release 2 introduces a new feature called Recursive Subquery Factoring. My collegue Lucas sees it as a substitute for Connect By based hierarchical querying, Oracle RDBMS 11gR2 – new style hierarchical querying using Recursive Subquery Factoring. When I first was thinking about a pratical use for this feature I couldn’t come up with anything, but on second thought:: solving a Sudoku! "53 7 6 195 98 6 8 6 34 8 3 17 2 6 6 28 419 5 8 79"
Great post. Now you can start in an tournament. Anton and his machine. before your query you get a nice column like your puzzle. @c: Maybe it suffices to find one solutions, this query finds all solutions.Â And that has nothing to do with breadth- or depth-first searching,Â that’s because there’s no way to stop the recursion after finding a solution. 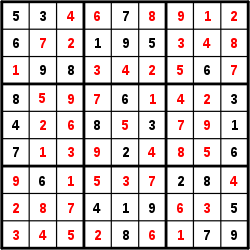 It looks to me that what the recursive subquery does is “breadth-first search”, i.e., for each blank square in the sudoku, it considers all possibilities before moving on to the next blank square. That computes all solutions to the sudoku, but I’m wondering if that is a good way of solving a sudoku in practice because it generally suffices to find one solution. @Bijesh K Recursive subfactoring is something Oracle introduced in 11GR2, so you can’t convert this kind of solutions to 10g. Its brilliant effort, I tried to convert sudoco query in 10g but I am not getting the correct result..Anybody can help me????? My method solves all sudokus. It’s a brute force solver, so it doesn’t need any clever strategies. how ever this dosen’t resolve all the sudoku types ..maybe just the easy ones.. for a more detailed explanation check this sudoku solver that also contains some strategies used by sudoku experts. 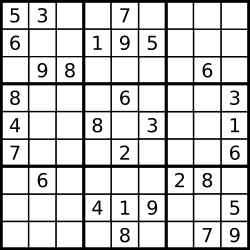 http://www.scanraid.com/sudoku.htm . For example i dunno how your algorithm would resolve the Intersection Removal Strategy called also the Pointing Pairs Strategy. I had no idea that Oracle was so late with its recursive queries. Those ports in PostgreSQL and T-SQL look very similar to my solution. I’m impressed, both by the possiblities from those languages as by the porting qualities of Frank and Mike. Thank you Anton for the solution. I don’t know anything about MySQL, but I don’t think this query will run unchanged on any database except the latest Oracle 11gR2. Can you do this with MySQL? 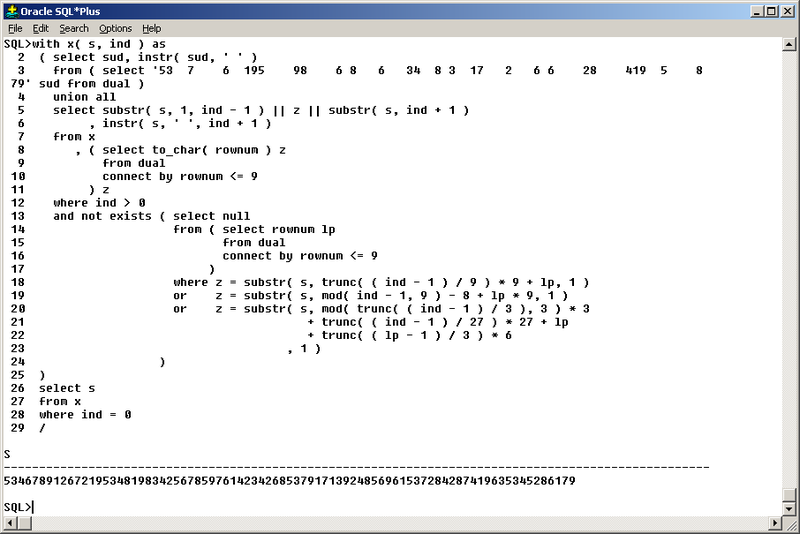 If the Sudoku has no solutions the result of the query is “no rows selected”. But it can take a lot of time before you get that result, I stopped it after 5 minutes using the suggestions of chithanh. If the sudoku has more solutions, every solutions is shown. that is a genius solution. what happens if the Sudoku has no solution? C.J. Date would not approve of this abuse. Hm. Seems that the comment system ate the spaces. BFD, you can cheat at a game. Impressive! Shared it on Facebook & Twitter. We now shall call you a “Sudoku Master”. Powerful ! Can call it Art. Really very impressive! Well done.